Aboriginal people settled Australia’s hot, dry interior at least 10,000 years earlier than previously thought, according to new archaeological evidence unearthed from an ancient rock shelter. It’s a remarkable discovery that points to a level of technological sophistication previously unknown to exist in Australia or Southeast Asia during the late Pleistocene—and it could reshape our understanding of how the last habitable continent on Earth was settled. Humans arrived in Australia about 50,000 years ago, after island-hopping in boats from Southeast Asia and through Papua New Guinea. How quickly people managed to disperse across the continent is still a matter of debate, but it’s widely believed that early settlers took a coastal route, avoiding the extremely arid conditions of the Australian interior for many thousands of years. 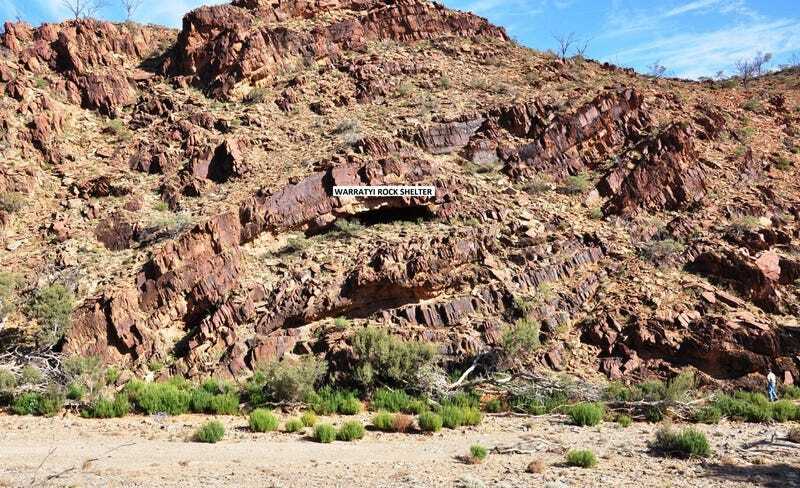 Not so, according to a new analysis of material excavated from the Warratyi Rock Shelter, a Pleistocene-era settlement located in the Flinders Ranges of southern Australia’s arid zone. Writing today in Nature, a team of researchers report radiocarbon and optical dating evidence showing that the site was settled approximately 49,000 years ago. Within a few thousand years of arriving on Australia’s shores, people were living in the continent’s harshest environments. The Warratyi site also provides some of the strongest evidnece yet for a direct link between Aboriginal Australians and now-extinct megafauna, with remains of the giant marsupial Diprotodon optatum and the giant bird Genyornis newtoni found alongside human artifacts. While Pleistocene hunters are thought to have played a role in the demise of these giant animals and many others, direct evidence to support that hypothesis is very hard to come by. There are still plenty of open questions about when and how Australia was first populated, and how the ecological landscape changed after people arrived. But if one thing’s becoming clear, it’s that humans didn’t waste much time taking the place over.